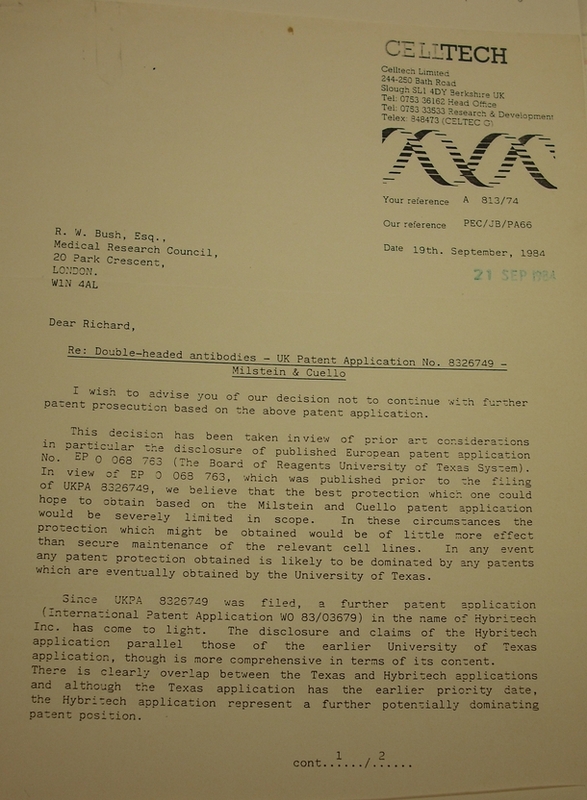 Early on, Milstein recognised that the hybridoma technology he and Köhler had devised might have useful applications, but that he would have to demonstrate what it could do before it would be adopted. Temporarily, he had to drop his basic scientific ivestigation into antibody diversity. The key challenge he faced was proving the value of monoclonal antibodies over conventional polyclonal antibodies for different applications. This would not be straightforward and would require the help of others. This photograph shows Milstein with Claudio Cuello in earnest discussion during one of the many walks they took together. Milstein and Cuello established a long lasting collaboration and friendship while they were both scientific MRC staff in Cambridge. One of Milstein's first collaborators in demonstrating the practical applications of monoclonal antibodies was Claudio Cuello, a fellow British-Argentinian neuroscientist who was then attached to the MRC's Neurochemical Pharmacology Unit in Cambridge. Their collaboration continued even after Cuello moved to the Departments of Pharmacology and Human Anatomy at Oxford University in 1978. Milstein and Cuello started thinking through how they might work together soon after Köhler and Milstein published 'Continuous cultures of fused cells secreting antibody', Nature, 256 (7 August 1975) 485-7. At the time, Cuello was wrestling with the difficulty of characterising Substance P (SP), known from the 1930s to be involved in pain and neurotransmission. His objective in this research was to determine whether SP was a peptide transmitter and to map its pathway within the body so that he could unravel the relationship between SP and disease. When Cuello began his collaboration with Milstein, he and his team had already gone some way to characterise and visualise SP. Yet this work had been laborious and time-consuming and their method was unreliable. The technique they were using for the research was immunohistochemistry, an immuno-based test, which by then was a commonplace procedure. The method exploits the binding mechanism between antibodies and specific receptors on the surface of cells to enable the analysis and identification of different cell types. In this context, antibodies are tagged with a label, such as a fluorescent dye, to serve as markers for locating receptors on the surface of a cell. 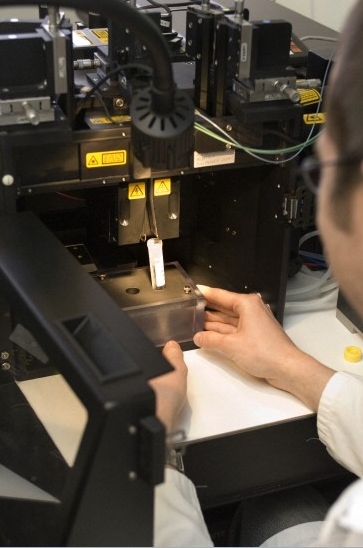 This allows scientists to measure and track particular cells in biological samples such as tissue or organs. 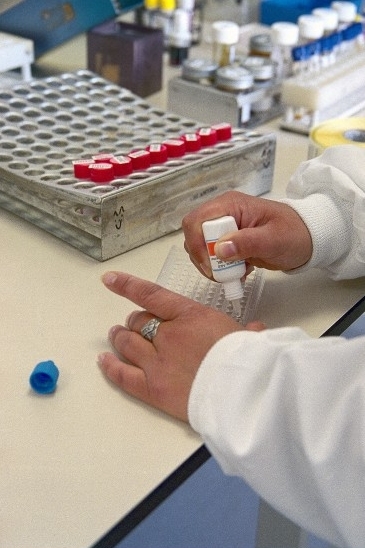 Click here to see Milstein's discussion of the difficulties with early immuno-based tests. The major advantage of the immuno-based test was that it could be done in conjunction with an electron microscope. However, the technique had a major drawback in the early 1970s: it was reliant on the use of antibodies sourced from animal serum. Known as polyclonal antibodies, such antibodies are difficult to work with. They are heterogeneous and vary from preparation to preparation, which means they require extensive purification before use. Not only are polyclonal antibodies hard to standardise, they have a limited shelf-life. 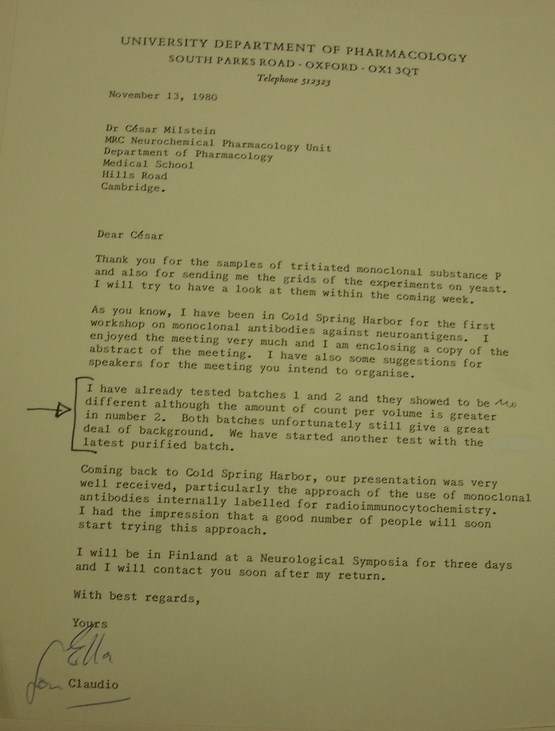 Such characteristics made it difficult for scientists in the early 1970s to reproduce their own results, and compare them with those of other scientists running similar immuno-based tests. 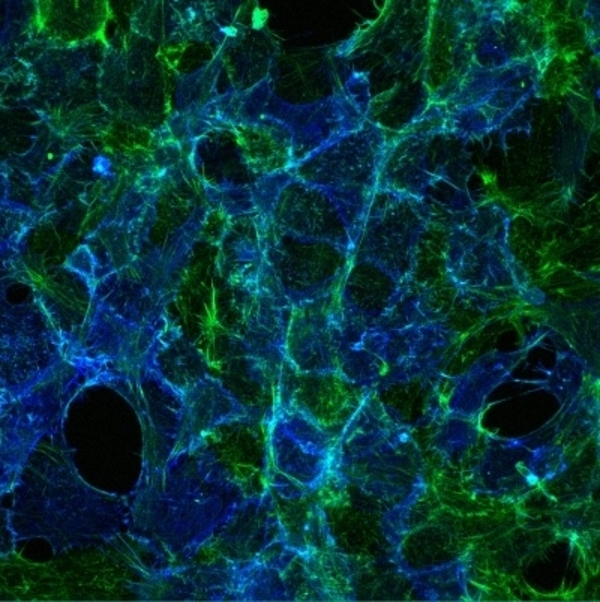 This image illustrates the binding of a tagged monoclonal antibody with an antigen receptor on a cell surface, which is the mechanism exploited in immuno-based tests. What Cuello and his team were using for their immuno-based tests to characterise SP were antibodies taken from guinea pig serum. This, however, posed certain challenges. 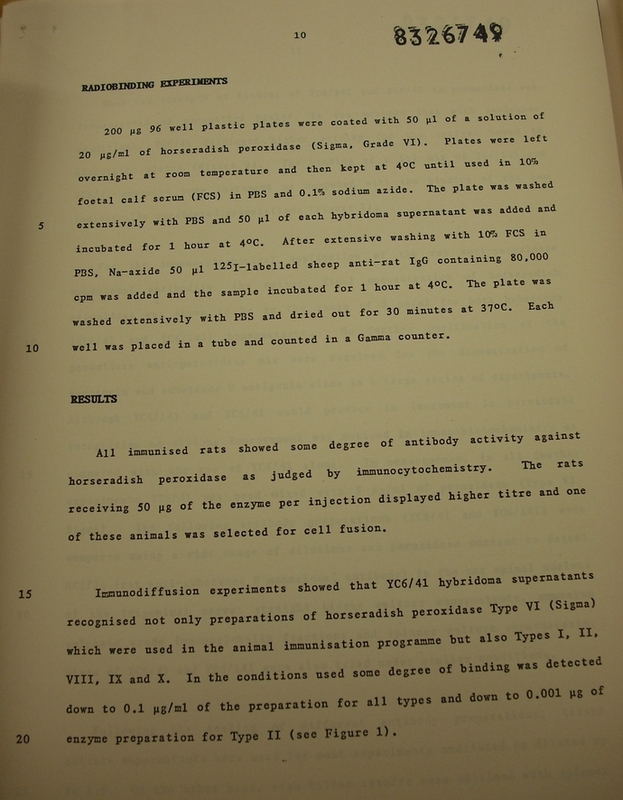 Firstly, the antibodies taken from such serum were limited in supply. Secondly, they often cross-reacted with other substances, as they were not specific to SP. 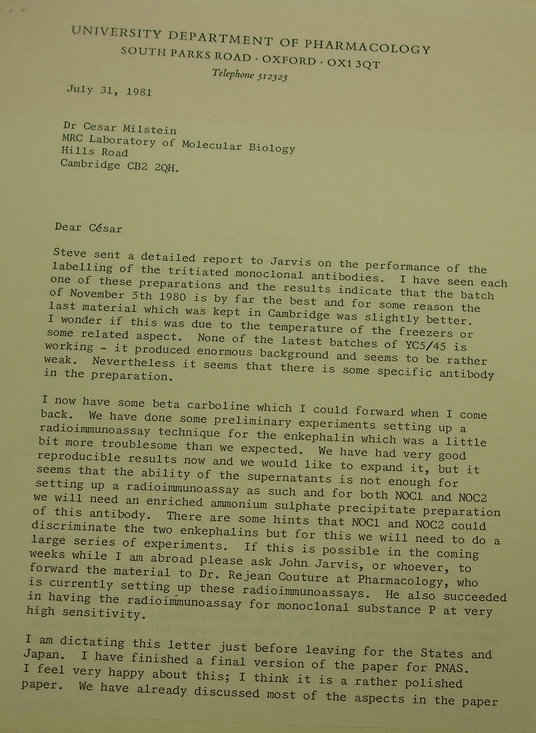 On chatting to Cuello in 1975, Milstein quickly realised that the technique for raising monoclonal antibodies presented a potential breakthrough for the difficulties Cuello was then facing. Crucially, it offered the possibility of generating unlimited standardised antibodies which specifically targeted SP. By helping Cuello create a monoclonal antibody specifically for SP, Milstein not only hoped to aid Cuello in his work, but also to satisfy his wider agenda, which was to demonstrate the practical utility of monoclonal antibodies. When Milstein and Cuello started their experiment to develop a monoclonal antibody specific to SP, many were sceptical about the utility of monoclonal antibodies over polyclonal antibodies. By 1979, however, the two scientists had succeeded in generating a monoclonal antibody specific to SP that proved a highly effective tool for characterising the neurotransmitter peptide. Milstein and Cuello's collaboration on SP represented the first of many applications of monoclonal antibodies in neuroscience. Within a short time, Cuello and Milstein, together with other colleagues, were using the hybridoma technology to develop monoclonal antibodies for the detection and mapping of other neural proteins, including serotonin and enkephalin. With their monoclonal antibodies, Milstein and Cuello had opened up a new world in neuroscientific dissection. This would help lay the foundation for better understandings of diseases like Alzheimer's and Parkinson's providing the pathway to improving neuropharmacological drugs. Click here for letters between Cuello and Milstein and others about monoclonal antibodies for immuno-based tests and examples of immuno-based tests. If monoclonal antibodies could be generated to target specific neuropeptide transmitters, Milstein realised monoclonal antibodies raised against other targets could be used in a whole range of immuno-based tests. 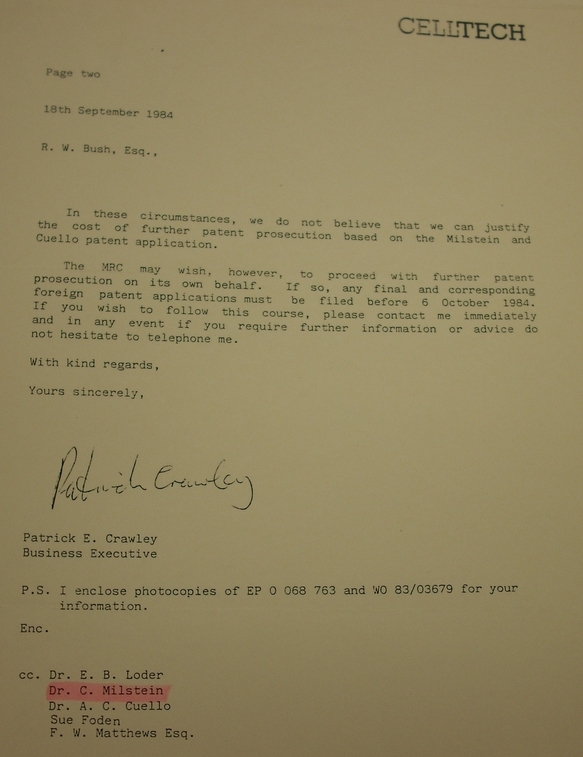 This, he believed, would help encourage the adoption of monoclonal antibodies into what had already become a routine procedure for diagnosis in the 1970s in fields such as parasitology, virology and cancer. Monoclonal antibodies offered such immuno-based diagnostics an unlimited standardised reagent which could be used in thousands of tests with the same reliability and reproducibility. In addition to extending the boundaries of neuroscientific investigation, Milstein and Cuello's efforts helped improve immuno-based tests overall. Significantly, their work inspired the revival of many techniques which had been neglected because sources of polyclonal antibodies were inadequate. One of Milstein and Cuello's key contributions was to help cut down the number of procedural steps involved in the making of immuno-based tests. This they achieved by demonstrating the possibility of conjugating monoclonal antibodies with enzymes and radioisotopes to act as tags in the immuno-based test. This photograph shows cells with serotonin transporter proteins stained in green. The image was achieved with a monoclonal antibody based immunoassay. Photo credit: Wellcome Images, B0004135. The power of immuno-based tests was further enhanced by Milstein and Cuello's development of bispecific antibodies. This combined two antibodies that recognised two different antigen epitopes, that is the portion of the antigen that binds to an antibody. The bispecific antibody was advantageous because it provided a tool that bound two different antigens simultaneously. This enabled the development of a single-step assay system as it eliminated the need for a second antibody. In the case of immunohistochemistry it also helped improve the sensitivity of the test, simplified staining procedures and improved signal detection. This work was published in C.M. Milstein and A.C. Cuello, 'Hybrid hybridomas and their use in immunohistochemistry', Nature, 305 (1983), 537-40. The paper inspired the rapid development of various bispecific monoclonal antibodies against different targets. Within a short space of time, a wide number of researchers had become involved in raising bispecific monoclonal antibodies. Some idea of the upsurge in this field can be seen from the fact that between 1989 and 1997 five international conferences were convened to debate bispecifics, not only for diagnostics but also for therapeutics. By 2012 more than 40 different formats of bispecific monoclonal antibodies had been designed and produced in the laboratory for clinical investigation and more were in the pipeline. 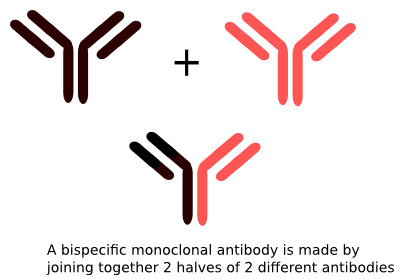 This diagram illustrates the process for making a bispecific antibody. 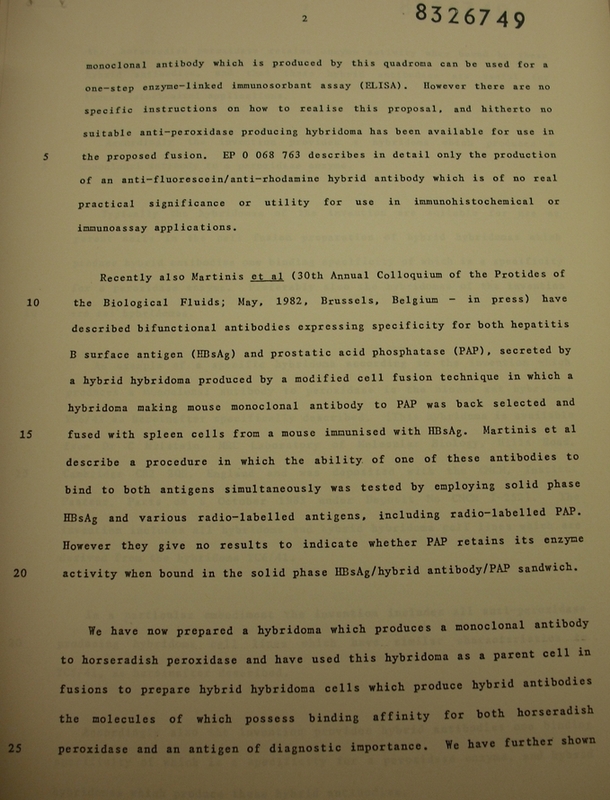 On 6 October 1983 Milstein and Cuello's technique for producing bispecific antibodies was filed for patent protection by the British biotechnology company Celltech. 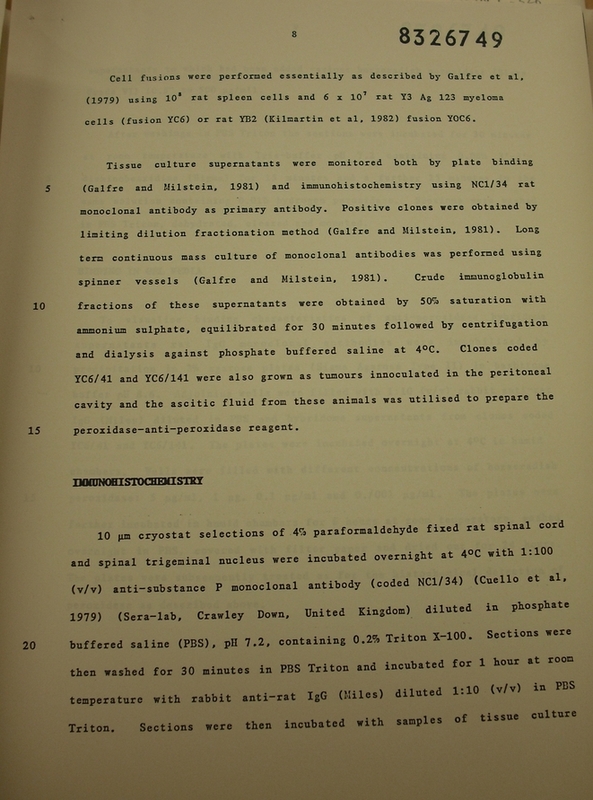 Although Milstein and Cuello had been the first to demonstrate the ability to make bi-specific antibodies, to their great surprise the patent application was later abandoned by Celltech and the MRC. The application was dropped on the grounds that a patent had already been filed by the University of Texas. Although this application had been filed on the basis of a theoretical proposition rather its practical demonstration, in legal terms, it implied that Milstein and Cuello had only put into practice an experiment predicted sometime before. This undermined any possibility of success with the patent application. Click here to see Milstein and Cuello's patent application for bispecific antibodies and Celltech's letter announcing its abandonment of the application. The abandonment of the patent for Milstein and Cuello's technique is particularly striking given that today bispecific antibodies are growing in popularity for therapeutics. It could be argued that, yet again, an important patent opportunity was missed. Some researchers doubt, however, that any substantial revenue could have been earned from any bispecific monoclonal antibodies produced from hybrid hybridomas during the life-time of such a patent. Soon after starting his work with Cuello, Milstein began another collaboration that would help demonstrate the utility of monoclonal antibodies in another field. His partner in this endeavour was Leonard Herzenberg, an American from Stanford University Medical School, who arrived in Milstein's laboratory in 1976 for a brief sabbatical. During his visit Milstein and Herzenberg began working together on the development of monoclonal antibodies to improve the utility of a fluorescence-activated cell sorter (FACS). This was a machine that Herzenberg and some engineering colleagues had devised in the early 1970s to automate the separation of cells. It was designed to help characterise, isolate and count different subsets of cells, notably white blood cells, that co-exist in blood and various organs. 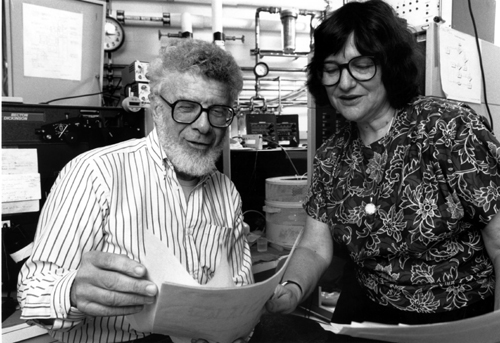 This shows the American immunologist and geneticist Leonard Herzenberg together with his wife Leonore Herzenberg, a fellow geneticist and immunologist. Photo credit: Stanford Medical School. By the time Herzenberg arrived in Cambridge, his FACS could sort 5,000 live, functional cells per second, and it was being marketed by the medical device company Becton-Dickinson. The FACS, however, still had some teething problems. One of the key challenges was that the FACS, like other immuno-based methods at that time, relied on polyclonal antibodies. 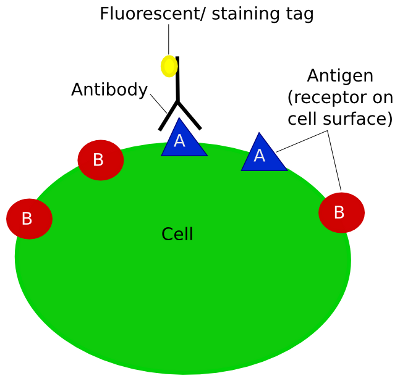 These antibodies, conjugated with fluorescent tags, were integral to the sorting mechanism in the instrument. 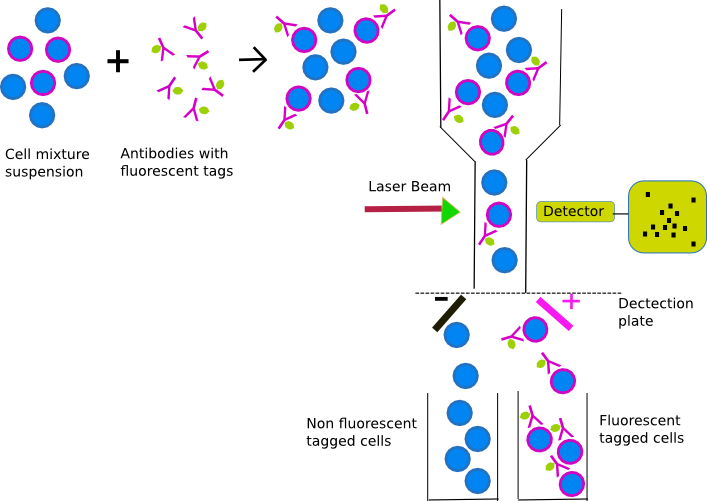 Such antibodies targeted receptors on cells to facilitate the picking up and sorting of such cells with the use of a laser detecting fluorescence. The difficulty was that these antibodies were not standardised and were in limited supply. Moreover, they had a tendency to cross-react. Conjugating these antibodies with staining agents was also laborious and slow. Click here to see FACS in operation. On arriving in Milstein's laboratory, Herzenberg immediately grasped the utility of monoclonal antibodies for improving the performance of the FACS. To this end he partnered with Milstein to develop monoclonal antibodies for use in the FACS machine. Much of the research was undertaken with the help of Herzenberg's wife, Lenore, and Vernon Oi, a graduate student from Stanford University. By 1977 Milstein and the Stanford scientists had generated the first monoclonal antibodies in mice capable of use in the FACS. Designed to screen determinants on the surface of many cells on a large scale, these monoclonal antibodies helped improve the reliability of FACS and boosted their popularity for many different purposes. Today the FACS is a ubiquitous tool within the laboratory. In biological research, for example, the instrument is used to investigate cellular functions, measure metabolic processes in cells and work out how viruses infect cells. On the medical front, it is used for routine clinical tests involving the counting of white blood cells, as is needed in diseases like AIDS, and for the assessment of the efficacy of chemotherapeutic treatment for diseases like leukaemia. In addition to helping to develop monoclonal antibodies to enhance the sorting and counting of different cell types, Milstein became immersed in another project that would open up a new understanding of the surface of the cell. His work in this area was triggered by a chance conversation he had at a conference at Coldspring Harbour (USA) in June 1976 with Alan Williams, an Australian immunochemist based at Oxford University. Prior to meeting Milstein, Williams had spent many years attempting to purify antigens and antibodies in order to develop a probe that would distinguish between different white blood cells (lymphocytes) and to work out their functions. Such efforts were also directed towards identifying the cell surface molecules involved in the mediation of lymphocyte function. This he saw as a means to unravelling the biochemistry behind immunological reactions. By the mid-1970s, Williams and his team had made a number of advances. Specifically they had purified an antigen known as Thy-1 that proved an effective tool for locating T-lymphocytes in mice. They had also identified a leucocyte-common antigen using antibodies taken from the serum of rabbits immunised against rat lymphocytes. Overall, however, they found it difficult to secure antibodies with the right strength and specificity for their target. Williams believed the technique developed by Milstein and Köhler might resolve such problems. Soon after meeting in Coldspring Harbour, Milstein and Williams set up a collaborative project. The first monoclonal antibodies they chose to produce targeted a rat's thymus. Their choice of the thymus was deliberate as it is known to play an instrumental role in the immune system. Notably the thymus produces T-lymphocytes (T cells) which identify and attack foreign substances. 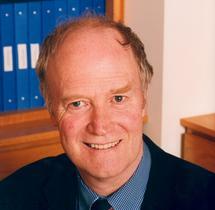 This shows Alan F Williams, Honorary Director from 1977 of the MRC Cellular Immunology Research Unit based at the Dunn School of Pathology, Oxford University. Photo credit: Royal Society. 'The basic protocol of the collaboration was as follows. We produced the cultures and clones and sent the supernatants by urgent mail. 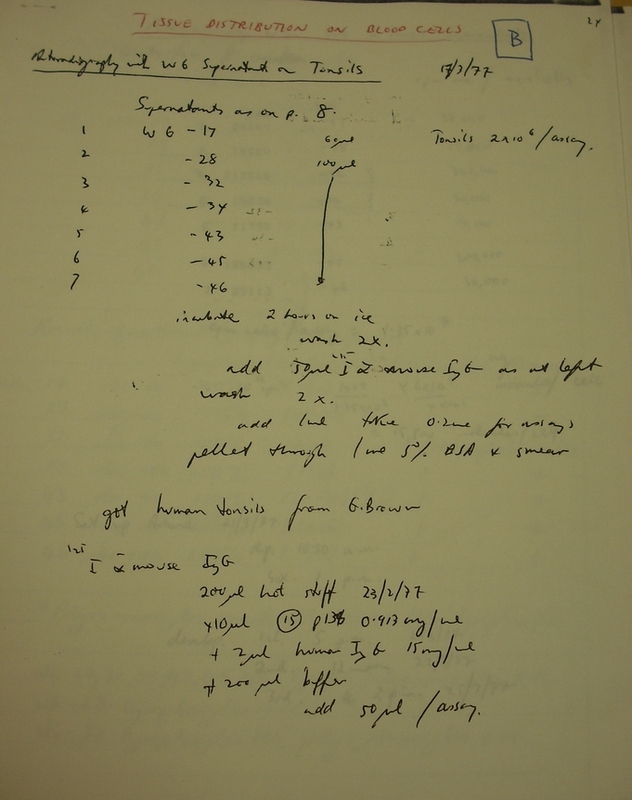 As soon as he got them, Alan proceeded to do the binding assays, and usually within 24 hours he would phone (no faxes in those days) the results (perhaps 100 assays per round) for us to proceed with clonal selection. Speed turned out to be essential. We discovered that contaminating clones or chain-loss mutant all too often conspired against us. Indeed, literally hundreds and hundreds of failed attempts taught us a lot about the technical problems involved and how to tackle them.'(C. Milstein, 'The Hybridoma Revolution: An offshoot of basic research', BioEssays, 21/11 (1999), 966-73. 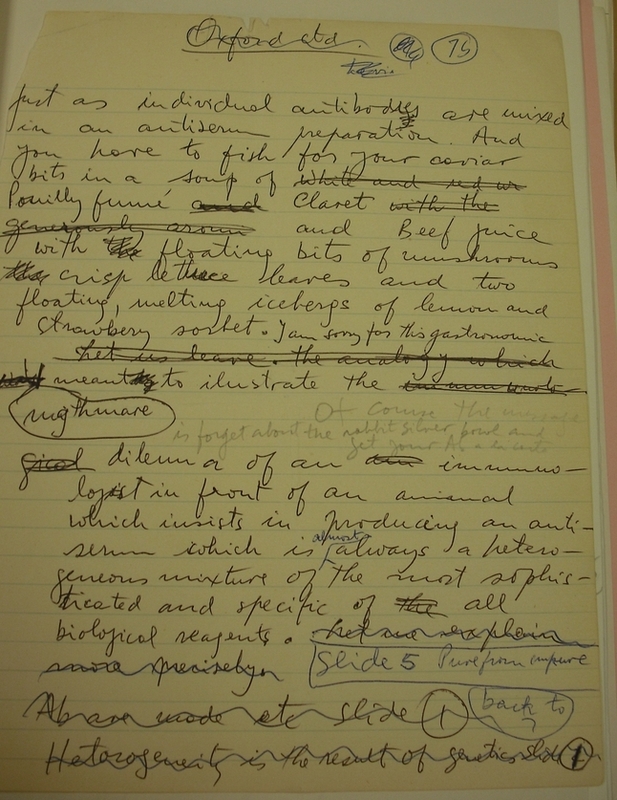 Click here to see pages from laboratory notebooks from Williams and Milstein relating to the development of a monoclonal antibody against a rat's thymus. Within months of having immunised mice with cell membranes taken from a rat thymus, the two groups of scientists in Cambridge and Oxford had succeeded in generating mouse-based antibodies to rat T cells. The experiment yielded three monoclonal antibodies for distinct subsets of T-cells in rats. 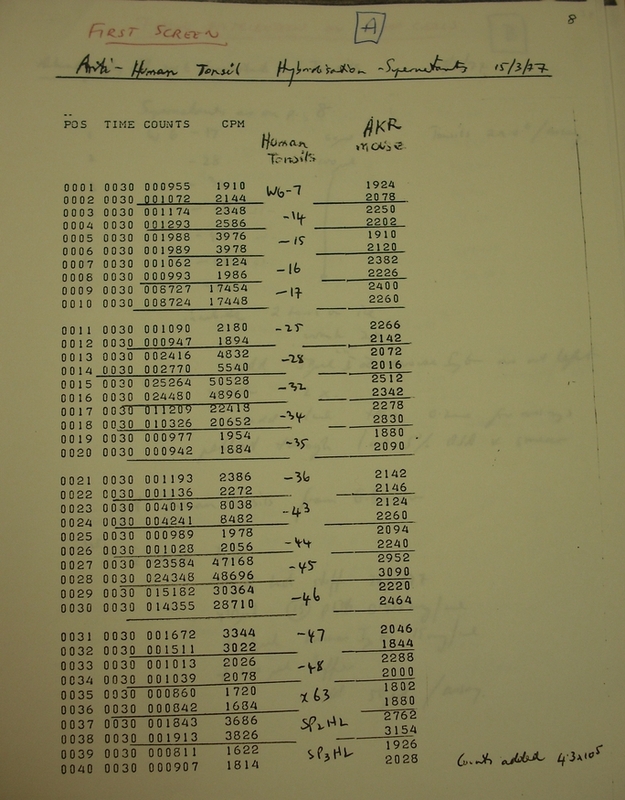 One of the most promising monoclonal antibodies was code named 'W3/25'. This later turned out to be the rat equivalent of a human antigen labelled CD4, which in the mid 1980s was identified as the receptor for the AIDS virus. When Milstein and Williams began their collaboration, it could be argued that scientists had as much knowledge about the surface of immune cells as they did of the surface of moon. 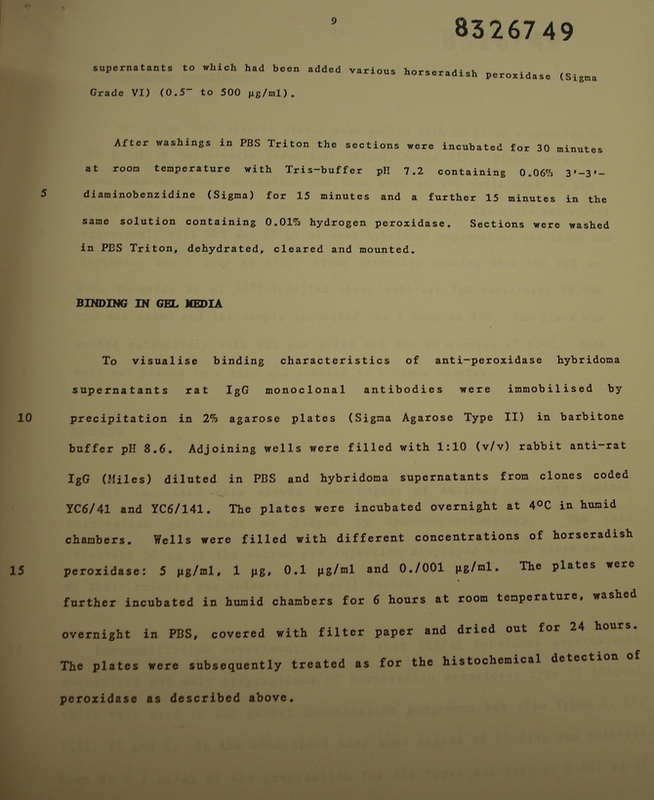 What was most exciting about their experiments was that they had shown it was possible to produce monoclonal antibodies to unknown cell surface antigens, and that such antibodies could be deployed to investigate and understand the function of such antigens on cell surfaces. 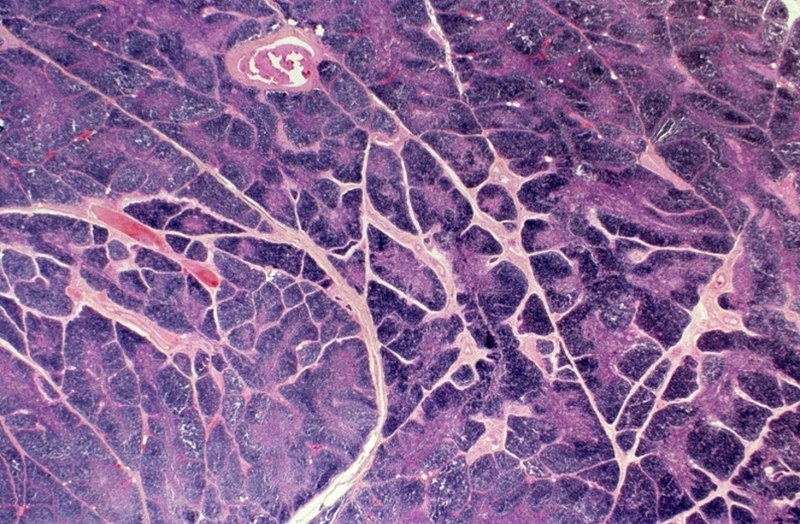 This shows a segment of tissue taken from a normal thymus in a child. The thymus is a pink-grey glandular organ at the base of the neck that helps to generate lymphocytes. Photo credit: Wellcome Images, W0047313. Results from the Cambridge-Oxford collaboration were published in A.F. 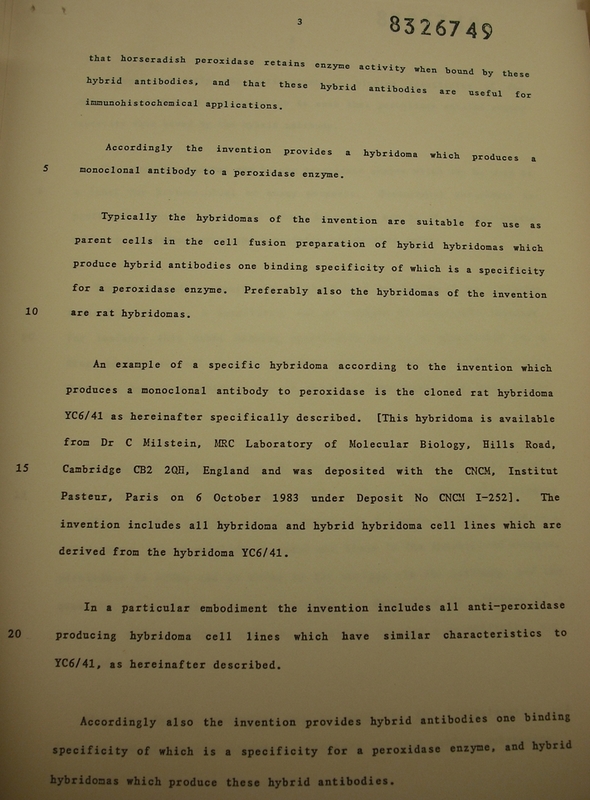 Williams, G. Galfré, C. Milstein, 'Analysis of cell surfaces by Xenogenic myeloma-hybrid antibodies: Differentiation antigens of rat lymphocytes', Cell 12 (1977), 663-73. In this article the scientists suggested that monoclonal antibodies might be developed in the future not only for investigating immune cells, but 'for the analysis of cell surface molecules of any sort'. Having generated monoclonal antibodies to rat T-cells, Milstein began to investigate whether the process could be replicated for making such antibodies to antigens found on human cell surfaces. His partner in this work was Andrew McMichael, an immunologist based in Oxford who had an interest in human T-cell immune responses to viruses. Started in the spring of 1977, Milstein and McMichael's project was an extension of the research undertaken by Milstein with Willliams. What Milstein and McMichael were interested in developing was a monoclonal antibody against human T-cells. This they believed could help further knowledge about the immune response in human health and disease. 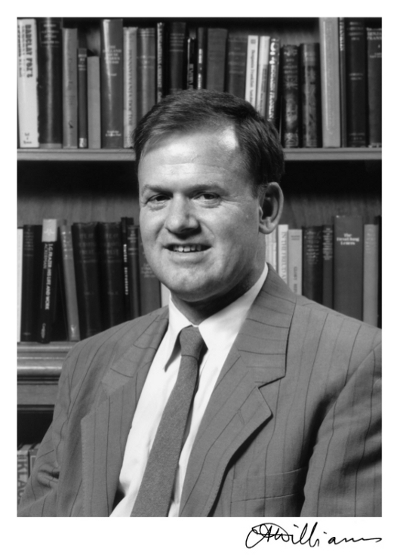 This shows Andrew McMichael, senior fellow in clinical science, Nuffield Department of Medicine 1977-79. Photo credit: Andrew McMichael. McMichael and his team in Oxford were given the task of immunising mice with human thymocytes (precursors to T cells that develop in the thymus) to generate antibodies against human leucocytes. The antibodies were then sent through the post for fusion with myeloma cells in Milstein's laboratory. 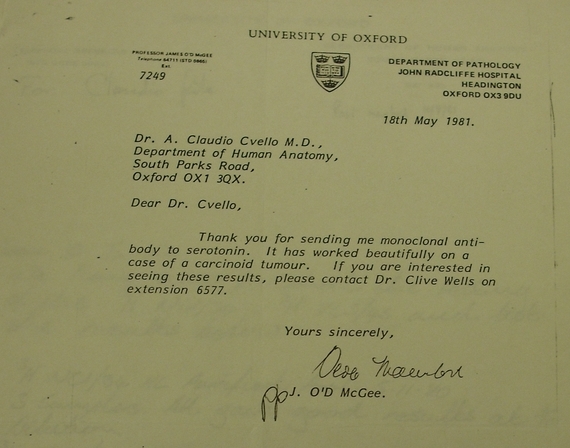 Once fused, the cells were then returned by post to McMichael's laboratory in Oxford, where they were analysed. The work was not easy. Initially, the scientists battled to perfect a good fusion with the cells. Having finally achieved a good fusion, the project nearly collapsed when the cellular culture became contaminated with fungus. By chance the team had earlier stored some cells in the freezer. These cells helped rescue the project. 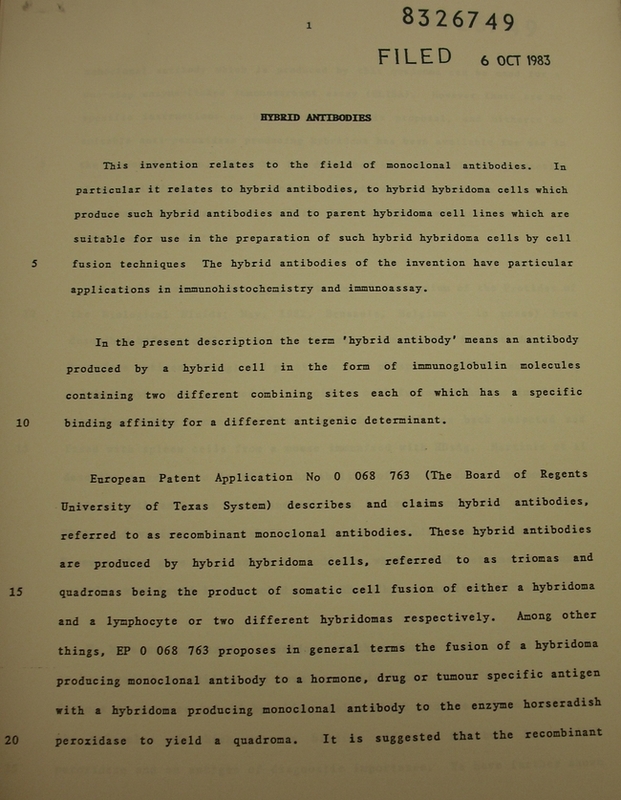 By late 1978, Milstein and McMichael's teams had produced a monoclonal antibody that was highly specific for human thymocytes. This represented the first discovery of a human leucocyte differentiation antigen using hybridoma technology. Despite their achievement, Milstein and McMichael initially struggled to find a journal that would publish their findings. 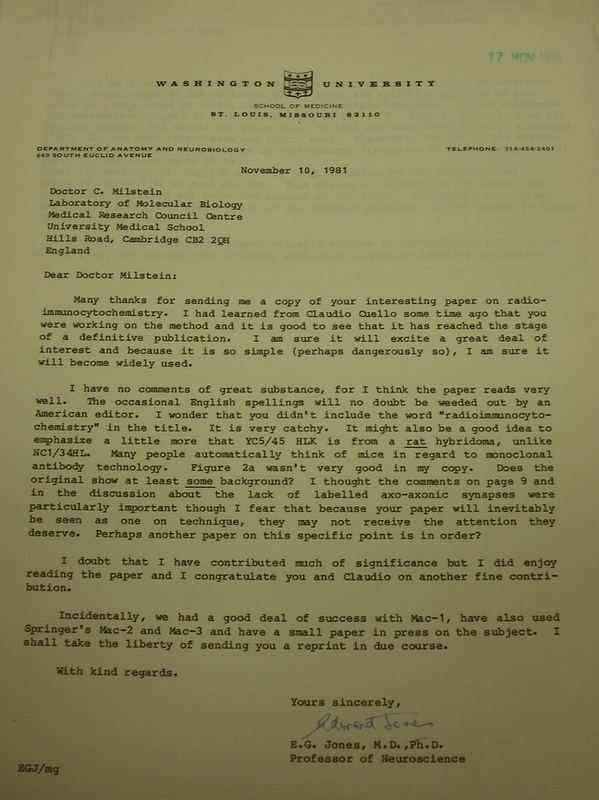 Notably editors of the Journal of Experimental Medicine rejected their paper without seeking referee's comments. This they did on the grounds such work was of 'little scientific interest'. Overall the editors believed the paper did not describe anything particularly different from what was then being done with polyclonal antibodies methods. In part, the editors' attitude reflected a more general lack of appreciation of the significance of differentiation antigens. It also stemmed the failure in the early years to grasp what hybridoma technology could achieve and from the fact that many scientists were still struggling to establish stable and viable monoclonal antibodies. Milstein and McMichael's research was finally published as A.J. McMichael, J.R. Pitch, J.W. Fabre, David Y. Mason, G. Galfré, 'A human thymocyte antigen defined by a hybrid myeloma monoclonal antibody', European Journal of Immunology, 9/3 (March 1979), 205-10. The article would go on to become a citation classic. Vials containing human interferon. Photo credit: National Institutes of Health, Wikipedia. In addition to exploring the use of monoclonal antibodies for probing the surface of cells, from 1976 Milstein began to wonder about their potential to purify natural products. He began working on this together with David Secher, who had been one of Milstein's doctoral students and was now his postdoctoral researcher. Curious to establish their utility for purifying natural products, Milstein and Secher established a collaboration with Derek Burke, a biologist at the University of Warwick who had a long-standing interest in interferon, a group of natural proteins released by an organism's cells in response to pathogens such as bacteria, viruses or parasites. The objective of the partnership was to develop a monoclonal antibody that might be used to purify human leukocyte interferon. 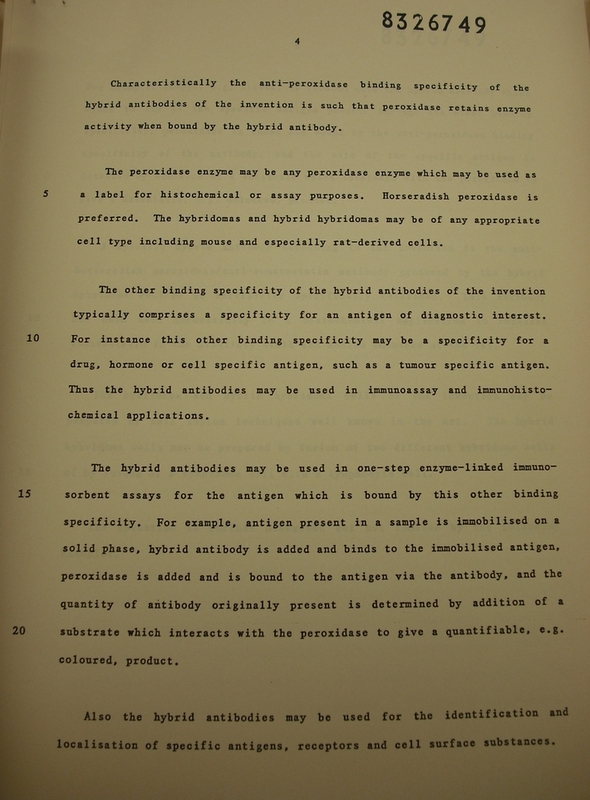 Since the late 1950s, researchers had deployed several methods for purifying interferon, but most could not yield the several thousand fold purification for turning interferon into a pure and clinically-useful product. 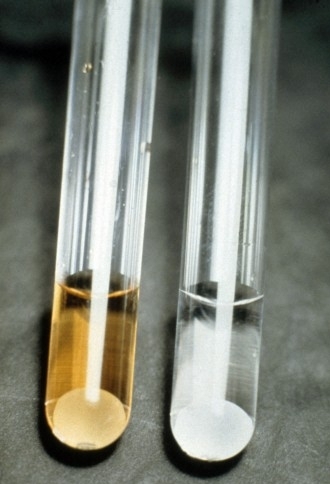 One of the most promising techniques for purification was immuno-adsorbent chromatography. The method allowed for the isolation and selection of the protein based on the binding properties between antibodies and antigens. However, the technique had a downside: it depended on the use of conventional polyclonal antibodies. What made matters worse was the fact that scientists only had access to impure interferon. Most antibodies available were therefore made by immunising animals with impure interferon. This meant that most antibodies available for the immuno-adsorbent chromatography targeted contaminants in interferon preparations rather than the interferon itself. Encouraged by Milstein from the sidelines, Secher and Burke next launched a project to produce a monoclonal antibody that could improve the immuno-adsorbent chromatographic method for the purification of interferon. The work was painstaking and there were many false starts. Just before Christmas in 1979, Secher and Burke were so disillusioned with their progress they considered abandoning their research altogether. By March 1980, however, they had created a system that yielded interferon that was about 100 times purer that anything managed before. Patented, Secher and Burke's method for purifying interferon was just one of the many stepping stones on the way to the commercialisation of different genetically-engineered versions of interferon as a drug in the mid-1990s. 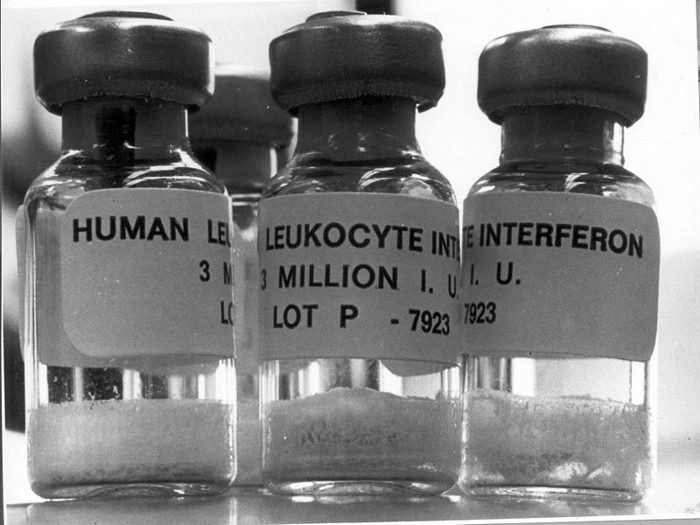 It would be approved for marketing as a drug to control multiple sclerosis, and as a treatment for cancer as well as various infectious diseases, including hepatitis B and C.
As early as 1975, Milstein attempted, with Köhler, to make monoclonal antibodies for typing the Rhesus (RH) blood group. They realised this could be helpful for blood typing, a technique that was important for ensuring safe blood transfusions. Little progress, however, was made. More success was to be had in generating a monoclonal antibody against another group of blood cells known as type A. This emerged by chance out of the work Milstein did with Williams to generate monoclonal antibodies for differentiating antigens on the surface of immune cells found in rats. 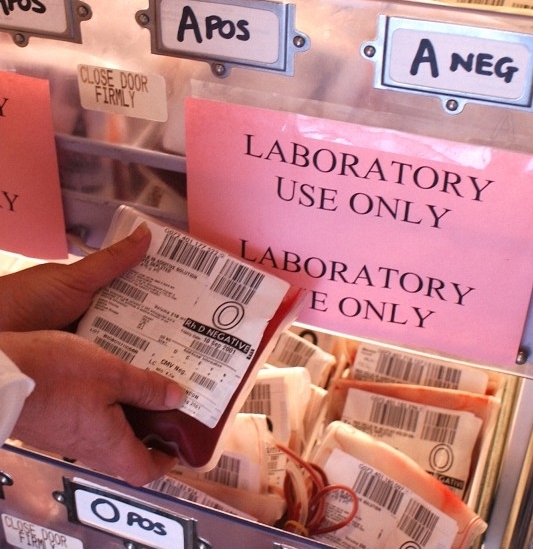 Milstein quickly grasped the potential monoclonal antibodies might hold for blood typing. 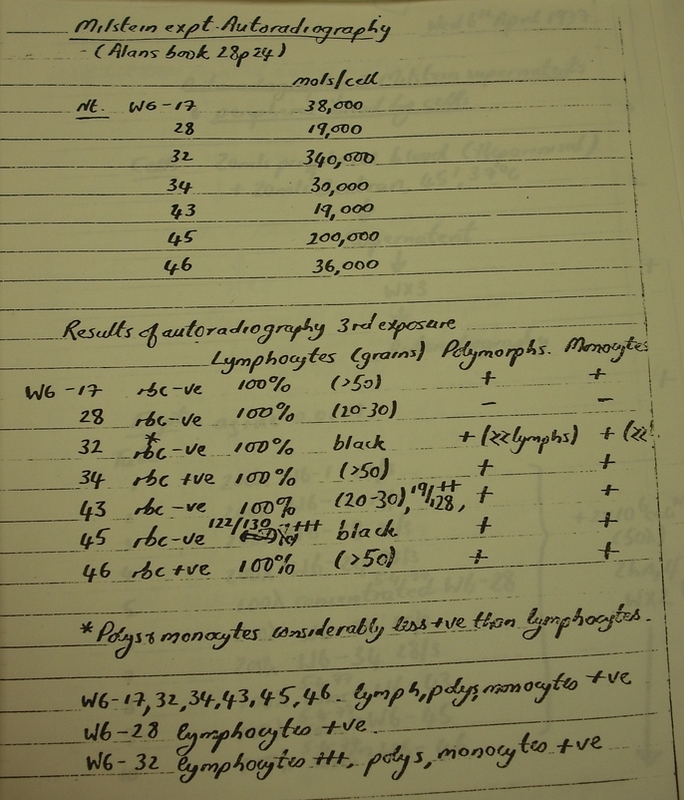 At the time, all blood grouping tests were performed using conventional polyclonal antibodies drawn from antiserum. These antibodies acted as markers that would bind and clump specific determinants of the red blood cells. This helped determine the blood group classification. 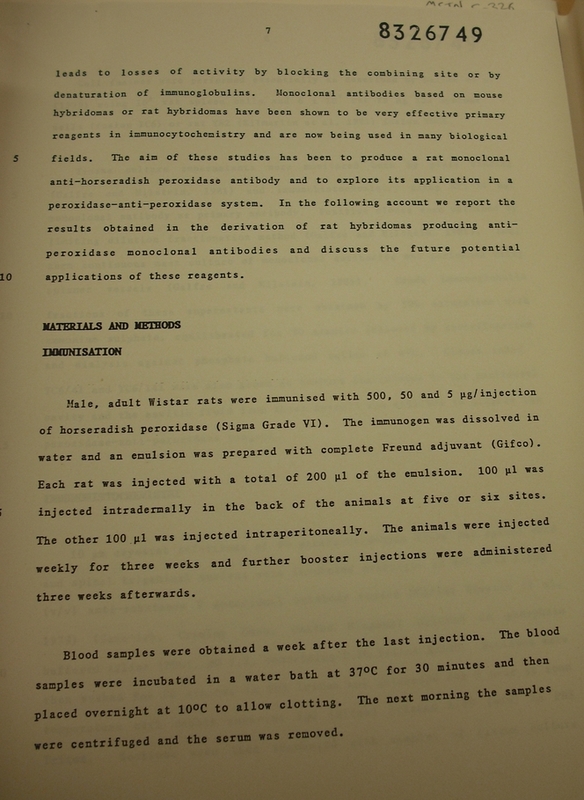 Up to the late 1970s, the bulk of antiserum used in blood typing was sourced from human volunteers. This supply, however, was limited. Moreover, the little that was available was under severe strain. In part this reflected an upsurge in blood typing to meet the increasing frequency of major surgery and the fact that human blood serum was also critical for other medical purposes. The shortage was not helped by the fact that no two human sera are alike and sufficient volumes of antiserum are difficult to secure with adequate antibody potency for giving reliable results. 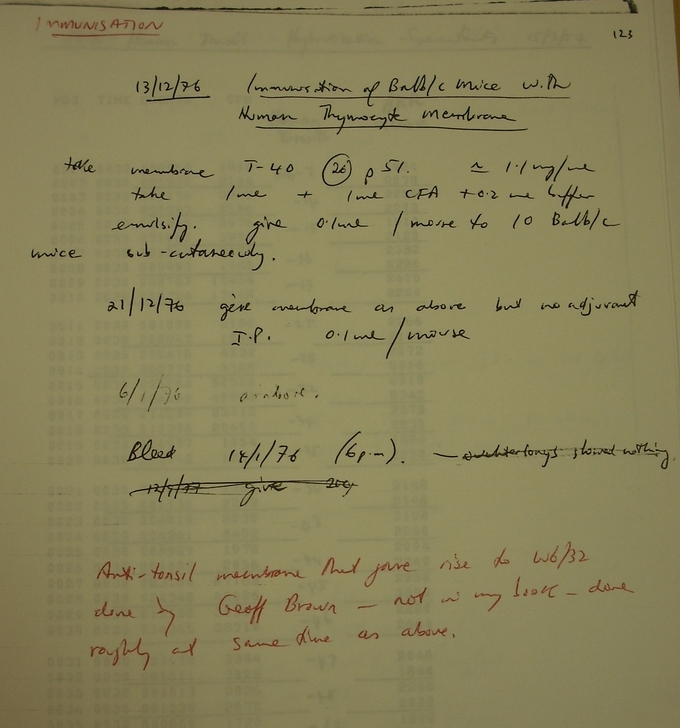 For Milstein, monoclonal antibodies provided an important tool for standardising blood group typing. 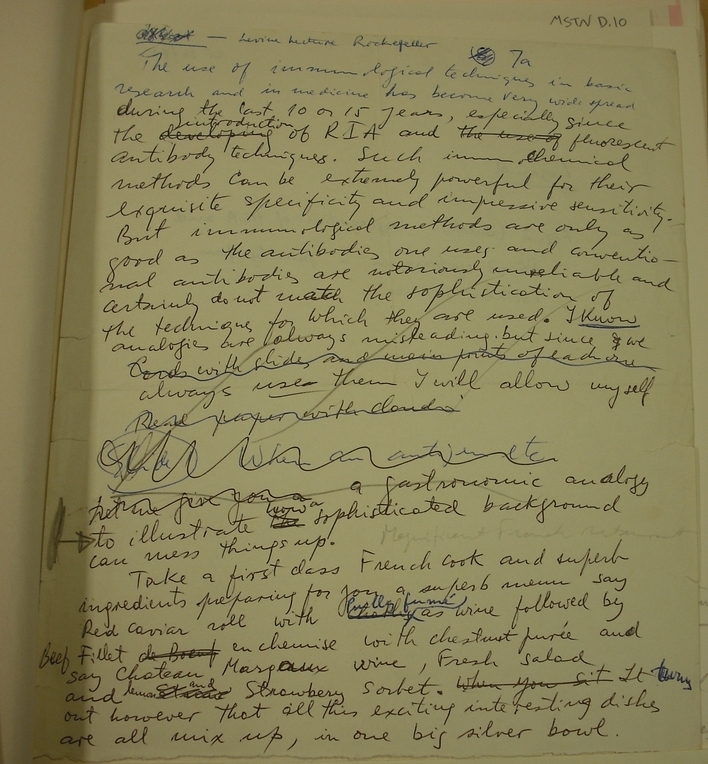 To this end he collaborated with Douglas Voak, a pathologist based in the Regional Transfusion and Immuno-Haematology Centre which was located at Addenbrooke's Hospital, just over the road from his laboratory. Initially, the monoclonal reagent they created had some problems, but within a short time they had produced one that showed itself an experimentally effective tool for typing blood group A. Soon after Milstein and Voak started their collaboration, they were approached by Steven Sacks, a medical graduate who had joined the Laboratory of Molecular Biology in 1978 to work as a doctoral student under Edwin Lennox, an American immunologist and founding member of the Salk Institute who had arrived in Cambridge in 1974. Sacks was curious to understand a strange phenomenon he had observed among some monoclonal antibodies that had been generated against different cancer tumours. These had been made as a tool to investigate the factors involved in the stimulation of the immune response against a tumour. When placed together with a mixture of cancer cells on a small plastic plate, the cells showed an unusual clumping in a disc-like formation. Surprisingly, he found that in addition to targeting tumour cells, the monoclonal antibodies appeared to target other cells. With the help of Voak and Milstein, Sacks discovered that he had inadvertently identified a monoclonal antibody that bound powerfully to antigens found on the surface of the human blood group type A. 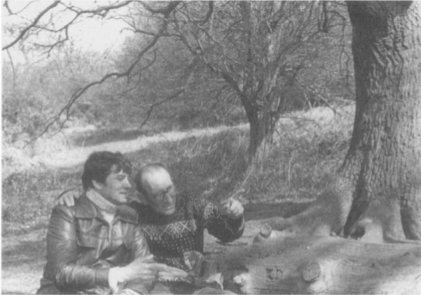 The type of clumping that Sacks saw can be seen from this photo, which he took to record his observation. 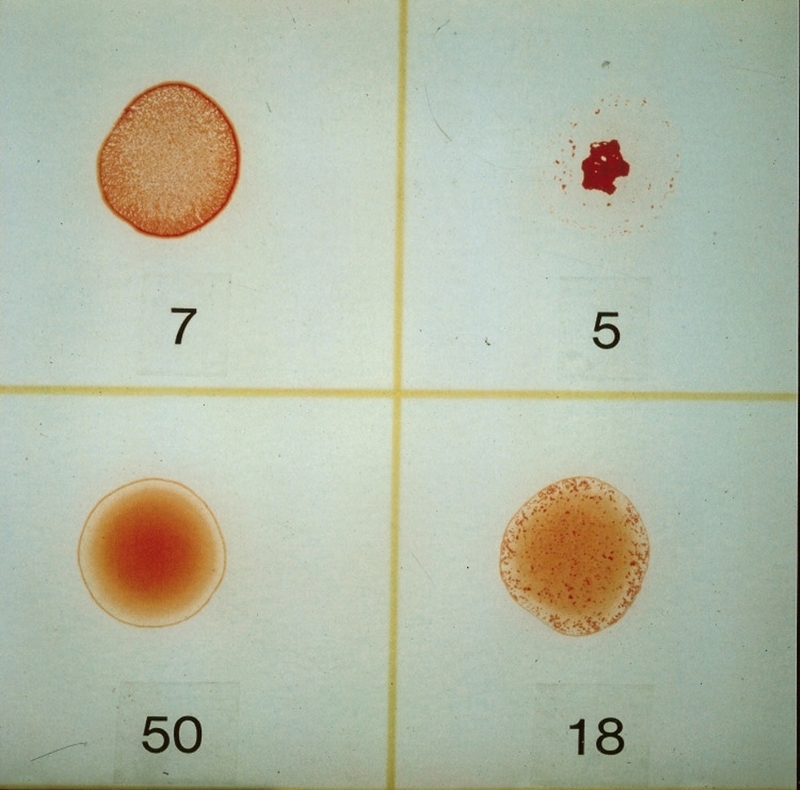 In the top row is a spot of blood from a person with a common type of blood group A (known as A1). To the left is the speckled clumping pattern following the addition of a conventional anti-A typing serum. To the right is a much stronger reaction causing the cells to clump into a single ball after the addition of the monoclonal anti-A. On the bottom row is a reaction with samples of blood expressing a weaker form of blood group A (known as A2). 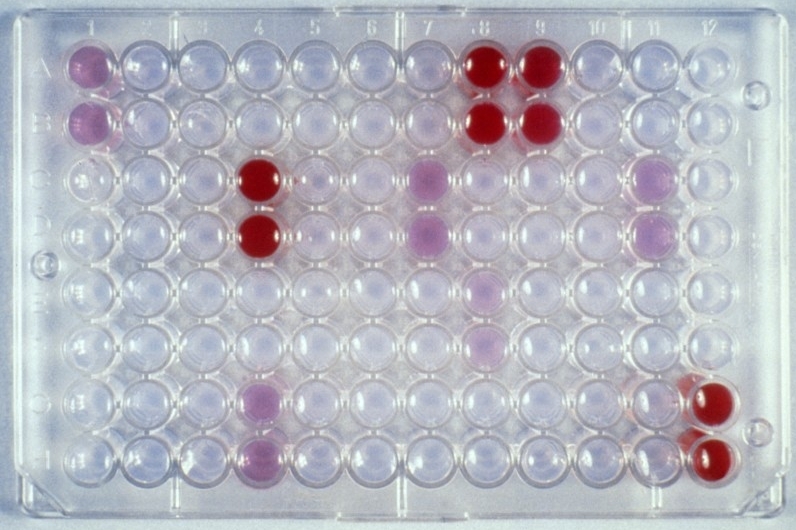 Red cell clumping is easily detected when the monoclonal anti-A is applied (bottom right), but more difficult to detect after the addition of the conventional serum (bottom-left). Photo credit: Steven Sacks. With Milstein's encouragement, Sacks set about developing monoclonal antibody reagents, together with Lennox and Voak, for routine typing work. 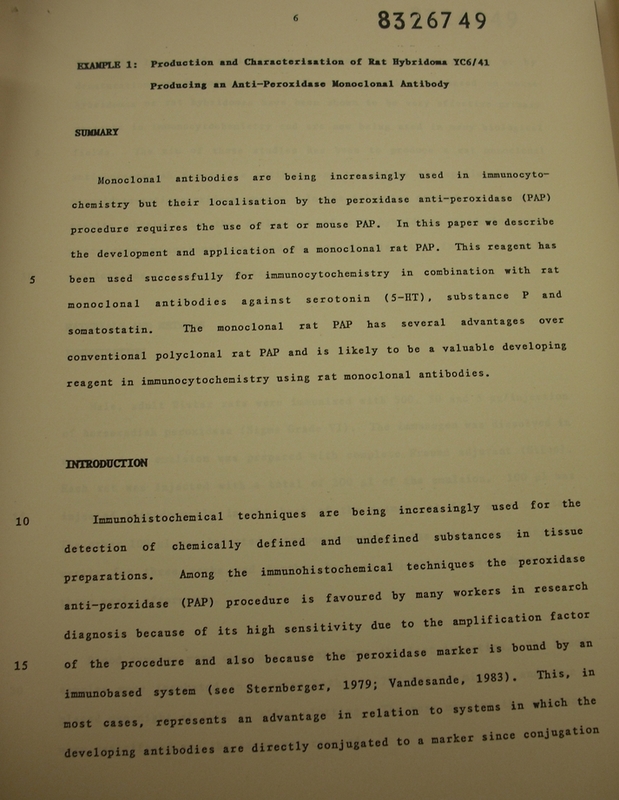 By 1982 the team had developed a number of different monoclonal antibodies suitable for routine use in ABO blood typing and had evaluated these agents against thousands of blood samples, both manually and through machines. These monoclonal antibodies were patented and commercialised by the newly created British biotechnology company Celltech, which saw the reagents as fundamental to its growth. In 1982 the company's executives estimated that the world market for such products was worth £7.5 million in terms of hospital sales and £3 million for other sales. Within seven years, over half of the world's blood-typing reagents would be based on monoclonal antibodies derived from those first developed in Cambridge and produced by Celltech. By 1989 it had become possible to produce 1,000 litres of monoclonal antibody supernatant in just 18 days, the equivalent of 2,000 individual human donations gathered through an automatic collection process. Importantly, the monoclonal reagents helped eliminate the workload involved in evaluating large numbers of small individual donations. The successful creation of monoclonal antibody reagents also eliminated the need to continue the risky practice of immunising volunteers to secure conventional blood typing reagents. This shows blood bags stored by different blood types. Photo credit: Wellcome Images, C0009182.